No Job is too big or too small shredding from 1 box to 50,000 pounds! 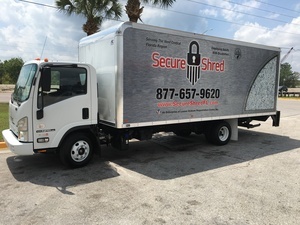 Secure Shred of Florida is a division of the Louise Graham Regeneration Center and provides businesses with the highest quality secure document destruction services. Secure Shred is AAA Certified by NAID (National Association of Information Destructions) and offers customers ongoing or one-time shredding. Services to: Brevard, Charlotte, Hernando, Hillsborough, Lee, Manatee, Martin, Orange, Osceola, Pasco, Pinellas, Polk, and Sarasota counties. When your company or organization uses Secure Shred the proceeds go back into the nonprofit Louise Graham Regeneration Center’s programs to help people with developmental disabilities. The center provides job and life skills training for adults with developmental disabilities that helps them become more self-sufficient citizens. Training areas include personal care and hygiene, financial education, basic computer, skills personal and workplace safety, and sills that promote employment. With identity theft on the rise and federal, state, and local regulations becoming more stringent, the need for secure document destruction is urgent. At Secure Shred we understand the importance of maintaining the highest level of security for your business’ confidential information. Our 5 steps to a secure shred insures compliance with regulations such as FACTA, HIPAA and Sarbanes-Oxley. Documents that your company may come into contact with every day may be covered under these and other regulations. These include financial records, payroll records, legal documents, personnel files, medical records, tax records and credit card receipts. Secure Shred helps you reduce your business’ exposure to liability and noncompliance. Our secure locked containers -- provided at no charge to you -- are stationed at your office. Trucks are sent to your location based on an agreed-upon schedule. Our locked trucks are equipped with GPS tracking that enables us to monitor our vehicle’s real-time location, route, stops, speed, and travel records at all times. Materials from the containers are retrieved by our professional, uniformed, insured and bonded drivers who transport the material in a locked, monitored truck to our secure shredding facility. Bin sizes and capacities are below. Our staff details each step of the destruction process including pickup, weigh-in, preparation, and shredding in an auditable report. Materials are mixed in preparation for shredding and contaminants are removed. The material is mixed prior to shredding as a security feature to ensure that final baled material is destroyed and cannot be reconstructed. Our controlled access facility is monitored continuously by security professionals who can respond to any alarm calls and troubleshoot any issues that may arise. Material is shred to 1/4 inch strips (more than twice the industry standard), and then compacted into 1,600-pound bales. Our facility features an infrared, motion-detected security camera network that enables us to monitor and record all movements in the destruction area continuously throughout the day and night. Baled material is sent to a paper mill for final pulverizing and recycling. Our paper mill vendors have signed a confidentiality agreement in order to receive baled materials. We provide your company with a Certificate of Destruction. Our two most popular secure shredding containers are our Standard Console and Top Loading Bin. Larger containers also are available. Each container is locked with the key given to the customer. For more information or to request a quote contact us today!